The first week of “The Voice” Semi-Finals displayed the Top 8’s mad talented singing skills as each artist sang one song that meant a lot to them emotionally, then another performance paired with another artist (not necessarily from the same team) in a duet. Viewers were treated to two mash-up duets. One from Kyla Jade and Spensha Baker, then another one from Jackie Foster and Rayshun Lamarr. 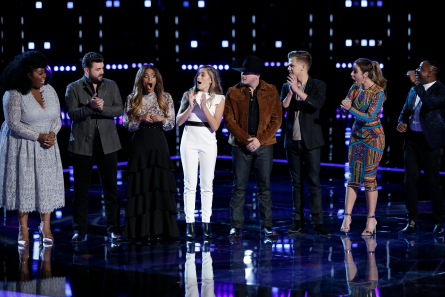 The remaining artists on Monday’s Top 8 live performances were: Jackie Foster, Britton Buchanan (Team Alicia); Rayshun Lamarr (Team Adam); Brynn Cartelli, Kaleb Lee (Team Kelly); Kyla Jade, Spensha Baker, Pryor Baird (Team Blake). Blake Shelton was the only coach whom still had all three of his remaining artists – untouched from last week’s Top 8 elimination Results Show. Brynn started her performance in a capella, she said to honor her generation. Brynn sang “What the World Needs Now is Love” by Jackie DeShannon. Blake reacted for 15 years old, or any age, Brynn is a master at mastering whatever the performance is. She really embraces the song and performance. Blake added that “it’s really easy to get lost in your performance.” Coach Kelly commented that “it’s crazy how innate everything in you at such a young age.” Kelly called her songs “epic, beautiful and tasteful.” She added that it’s a sign of a true artist. They sang duet “Hillbilly Bone” by Blake Shelton (feat. Trace Adkins). They sang together once before. But, against each other in the Battles. Viewers could see how Blake felt about this rendition when he gave them a standing ovation at the end of their performance. Jackie sang “Here I Go Again” by well-known 80’s hair band White Snake. Jackie said she wants to bring Rock back and said she “wants this (song) to be her anthem.” She said she’s so close to ther dreams, so close to the finale and it’s amazing to have Alicia Keys as a coach. She performed through heavy smoke, which Adam noted when reacting. Rayshun Lamarr is Team Adam’s last artist remaining on “The Voice.” He’s been in the bottom twice and America saved him both times! His fan following is called “Rayshun Nation.” He was Adam’s first pick and now the last one holding-on. Rayshun sang “Imagine” by John Lennon. Rayshun said his message with the song is we can live as one without treating people different. He said he wants it to be just be him and the message. Adam loves that Rayshun can sing soul music in that high range. Spensha sang Maren Morris song “My Church” song. The message of the song is what moves you emotionally. She said for her, it’s her family. Blake said Spensha is digging into this song more than any other song this season. After her Top 8 performance, Blake commented that “the damn just broke in this moment” because Spensha let everything out in this peformance that she had been holding back the whole season long. He said there’s no better time than for Spensha to have her moment and would be shocked if she’s not in the finale after this. Brynn and Britton sang “Can’t Always Get What You Want’ by the Rolling Stones. It was Britton’s second time performing a Stones classic. 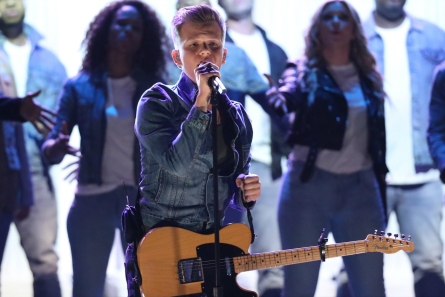 Kaleb was running an internet marketing company and when not working was at home with his wife and kids before “The Voice.” The message of the song is that “there’s hope” said Kaleb. He grew-up knowing that his dad didn’t want to be his dad. Kaleb said he wants to give kids hope. Kelly said Kaleb “killed it” and he’s grown so much from the Blinds. She added that this was the perfect time to do the song. Rayshun (Team Adam) and Jackie (Team Alicia) sang Imagine Dragons’ “Believer” and “Radioactive.” Jackie said there’s a reason why “ray” is in Rayshun’s name because he’s a ray of sunshine. Rayshun said Jackie is a rock-star and commands the stage. He said she’s “fireworks!” They finished their mash-up performance to a standing ovation from all the judges. Pryor said he’s dedicated 20 years to music. He said his experience on “The Voice” has changed his life. Blake chose “Change the World” song by Eric Clapton because it’s got blues and rock and little bit of everything. Pryor said the song is how he feels about his wife. Kelly said he constantly sounds in a state of “pleaing” and he’s all in. He has a “pleaing factor” or “an ache” she said. Blake called Pryor an incredible singer. He’s that guy that lives next door, that fixes the house when the tree falls on it. He really IS that guy. Blake predicted that Pryor will be in the finale. Alicia was pleased to tell Brittion that he’d be performing “The Rising” by Bruce Springsteen. It’s a song that Britton really wanted to sing and Springsteen is his inspiration. 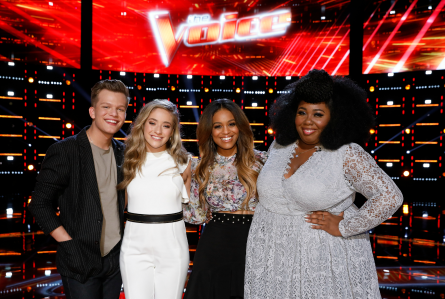 On Tuesday’s “The Voice” Results Show the Top 8 were reduced to the Top 4. Because of this, host Carson Daly called it “the most dramatic elimination of the season.” In those eliminations there were surprises galore! At the top of the show, Daly asked Blake, who had all three of his artists left, what it takes from an artist and a coach to get to the finlae. Blake answered that the coach has to be open to the artist’s ideas, and vice versa. He said it all starts in the Blind Auditons – to get that artist that is the right match. It’s Kelly Clarkson’s first season. Daly asked her what it means to her to have possibly two artists in the finale. She said “it would mean a lot to me to show that people love all kinds of music and the diversity.” She has two artists that are so different. On artists Britton and Jackie, their coach Alicia Keys said her bond with them gives strength, stability and encouragement. Adam answered Daly on what makes Rayshun unique? He said for Rayshun, he’s living on time that he wasn’t sure he’d have. Adam called Rayshun one of the most special, interesting and most dynamic people he’s ever met. Then, Daly brought the Top 8 artists out onto the stage to hear the first round of results from Monday night’s performance show. But, first Daly had more questions. Rayshun said to be there it’s the world to him and he’s thanking God for every moment. Brynn said her favorite part about being on “The Voice” is meeting and working with the amazing and talented coaches there. The first artist that advanced to the Top 4 next week for the finale show was Spensha Baker (Team Blake)! She was visibly shocked and stunned. The seven remaining artists came back onto the stage to hear more voting results. Brynn Cartelli (Team Kelly) made it through to the finale. An update was given on last season’s ‘Voice winner Chloe Kohanski from Team Blake. She will return next week for the finale show. She signed with Repulic Records and has been traveling from New York, L.A., Nashville and has performed with super stars like Steven Tyler. Kohanski said she’s currently working on her new single in Los Angeles called “Come This Far” which she’ll perform at “The Voice” finale next week. The third finalist was Kyla Jade from Team Blake! Two artists from Team Blake, and one artist from Team Kelly went through so far. 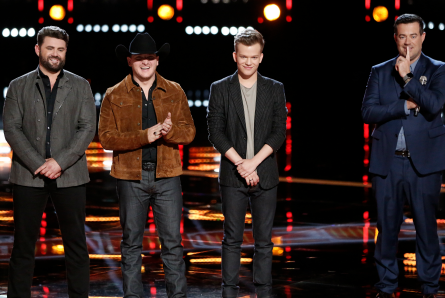 Next, Daly announced Britton Buchanan, Pryor Baird and Kaleb Lee as the bottom three arists who’d have to perform a Save Song to snag a spot in the finale. That meant Jackie Foster and Rayshun Lamarr went home. Pryor Baird performed “Soul Shine” by the Allman Brothers Band. Blake told America “this is your guy right here. Did you just hear what I heard?” He was surprised to see Pryor in the bottom and told him he deserves to be in the finale. Blake urged America to send Pryor to the finale. Kaleb Lee performed “Simple Man” by Lynyrd Skynyrd. Kelly told him that she’s so excited for him and he’s grown so much. She told America to vote for Kaleb. Britton Buchanan sang “Dancing on My Own” by Calum Scott. Alicia told Britton that he is “the real deal.” Adam added “the Universe finally gave me the chance to help you,” and he urged America to vote for Britton. Blake said no, there’s no last words for Pryor. He told Pryor that he’ll back him no matter where his journey takes him. Blake said he’ll be taking to him tomorrow whether they’re rehearsing or on the phone. Kelly told Kaleb that she loves watching Blake with his artists, and that could be her 16 years ago. She told Kaleb that this was not his defining moment. “It’s what you do after the show, and I will be there with you,” Kelly told him. Alicia told Britton that she wants to show gradtitude for America voting him through previoulsy. 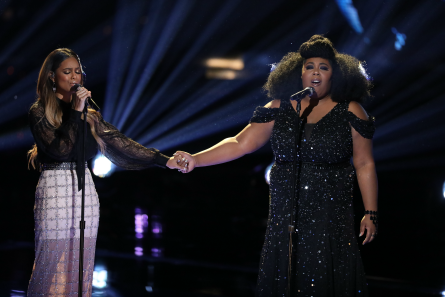 “You are the voice that music is made of – truth and honesty,” Alicia told Britton. 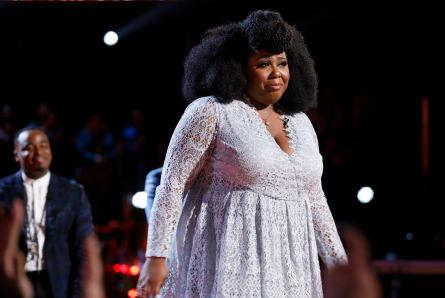 The Instant Save Vote went to – Brittion Buchanan (Team Alicia). That meant Pryor and Kaleb went home.